Over the years I have seen many health improvements from dietary changes and the inclusion of individually tailored supplement programs. A recent study confirmed the benefits of a Mediterranean-style diet with and without the addition of a medical food on women with metabolic syndrome. Metabolic syndrome involves many problematic abnormalities including abdominal obesity elevated plasma triglycerides and low HDL (good) cholesterol high blood pressure and insulin resistance. The National Health and Nutrition Examination Survey data shows that approximately one-third of the adult population in the US has metabolic syndrome. This is a huge number! People with this affliction are at risk for type-2 diabetes and cardiovascular disease (CVD). As one-third of the US population seeks traditional medical treatment for these conditions the cost burden to our already strained healthcare system is further exacerbated. This diet and medical food study demonstrates that there are simple and effective ways to reduce metabolic syndrome without having to dig too deep into your piggy bank or adding to the insurance burden. Scientists at the University of Connecticut University of Florida University of California and Metagenics analyzed the effects of a Mediterranean-style diet (high in legumes monounsaturated fats vegetables fish and some lean meats) both with and without the UltraMeal Plus 360® medical food on women with metabolic syndrome between the ages of 20 and 75. The supplement contains phytosterols soy protein hops and acacia extracts. It is believed to have anti-inflammatory and insulin-sensitizing properties along with a positive influence on lipid profiles. At the end of the 12-week trial the researchers found that both the diet only and diet plus supplement groups decreased their waist circumference systolic and diastolic blood pressure and plasma triglycerides. In addition the diet plus supplement group had a greater reduction in LDL and non-HDL cholesterol apoB apoB/apoA1 and plasma homocysteine. Thus the diet plus supplement group had the added CVD-lowering benefit of a less atherogenic lipoprotein profile along with lower plasma homocysteine. 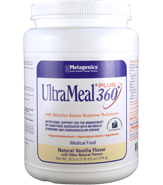 Here is an example of a dietary shift alone or with the added UltraMeal Plus 360® supplement being able to improve a wide-spread health condition. In only 12 weeks these participants were able to reduce CVD risk factors without the use of prescription medication or surgery. Seems like a good alternative or adjunct to prescription medication. Good health outcomes through food and lifestyle approaches to healthy eating...way to go!! Side note: while only women participated in this study over the years I have recommended the Mediterranean Diet with and without a medical food to men with excellent outcomes.